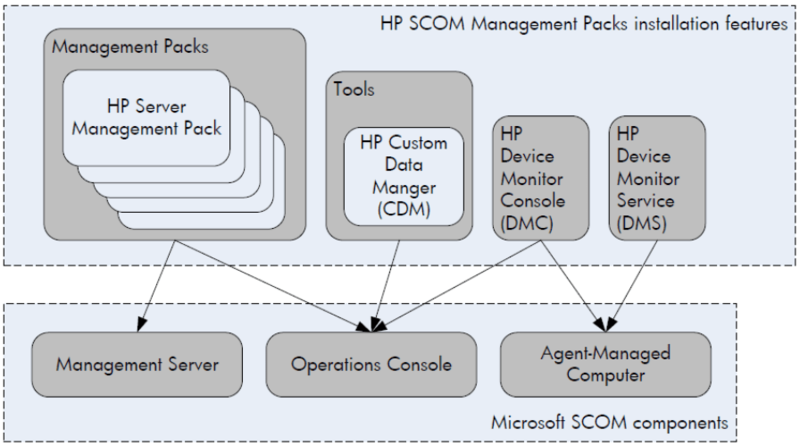 Recently in September HP has its latest management pack suite released for System Center Operations Manager called Insight Control for Microsoft System Center 7.1.1 actually it also contains the HP SCCM Integration Kit. In my case I wanted to monitor HP ESXi hardware and needed the proper HP management packs and software. I always found it some kind of troublesome to find the right stuff on HP’s website and it is not always clear what is being supported and what not. That’s why I would like to share my outcome. If you want to monitor HP servers (e.g. ProLiant G1 up to G7) and run Windows Server operating system on top of it you need to deploy the HP Insight Control Agent (SNMP and/or WBEM) and also the SCOM agent. After this happens you are able to import the HP management packs for ProLiant servers and everything should work fine. If you want to monitor VMware (ESX), Blade Servers or the new HP G8 (Generation 8) hardware you need to install the HP Device Monitor Console (DMC) / HP Device Monitor Service (DMS) which is basically a piece of software that manages the connection to the respective HP technology. I recommend installing this software on a dedicated server and not a management server because I try to keep management servers as “clean” as possible and I choose to install 3rd party software on a dedicated server. But this is my personal habit. Next deploy a SCOM agent to this dedicated server and import the management packs into SCOM for either VMware, Blade Server or the Agentless management pack for the new ProLiant G8 servers. A customer had the requirement to monitor ESXi 5 hardware on ProLiant DL380 G6 servers. Well after some researching and studying the HP guides I found the following supported scenarios. BUT what if you have a ESXi 5 running on older ProLiant hardware like DL380 G6 or even older? Well bad news – according to HP it is not possible to monitor the HP hardware like ProLiant DL 380 G7 and older where ESXi 5 is running on top. No there is no plan to support pre-Gen8 ESXi servers in ICSC*. ESX uses SNMP, so it was very similar to what we did to support Linux. However, ESXi does not use SNMP, but rather CIM, which is a whole different thing. Since we could get ESXi support “for free” with Gen 8 agentless, that was the route we chose. The entire documentation about HP’s Insight Control for Microsoft System Center you can find here. Nevertheless if you need to monitor ESX or ESXi I highly recommend the management pack from Veeam. Some time ago I wrote a post about it. You can find the post here. I hope this post saves you some time finding the right information! I have just spend DAYS trying to find a way to get this to work. 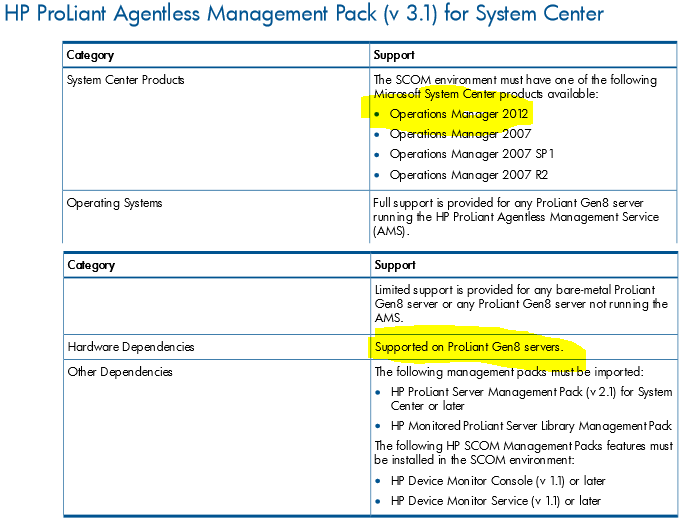 It is too bad they don’t just put that on page 1 of the HP Proliant VMware MP for MS System center documents. Very good post, it pointed me in the right direction. Now I’ve been looking how to add Agentless Server to the DMC but no luck, I’ve enabled SNMP on ESXi 5.1 (running on a Gen8 ProLiant server), but it just will not add the server. Am I missing something? I’ve spent already a fair amount of time looking for an answer, but HP guides are not up-to-date, and I could not find anything on Google. Any pointers on how to add an Agentless Server to DMC? As far I remember I configured the SNMP Settings on the ILO and used the DMC to connect using the SNMP Settings which I have configured on ILO. Check this here http://h30507.www3.hp.com/t5/Coffee-Coaching-HP-and-Microsoft/HP-ProLiant-Gen8-Agentless-Management-Overview/ba-p/108579. Thank you very much Stefan, now I was able to add the server to the the DMC by modifying SNMP settings on iLO. Now the only thing missing is that the DMS begins to populate the HP Agentless Servers view on SCOM, I don’t know if this just takes time or there is a problem with communication between the DMS and the Agentless MP. If you have any pointers, it would be greatly appreciated, but in any case thanks a lot for your help. I finally got it working, just needed to restart SCOM and DMS services and wait for a couple of hours for discovery. Thanks for your help Stefan, greatly appreciated. 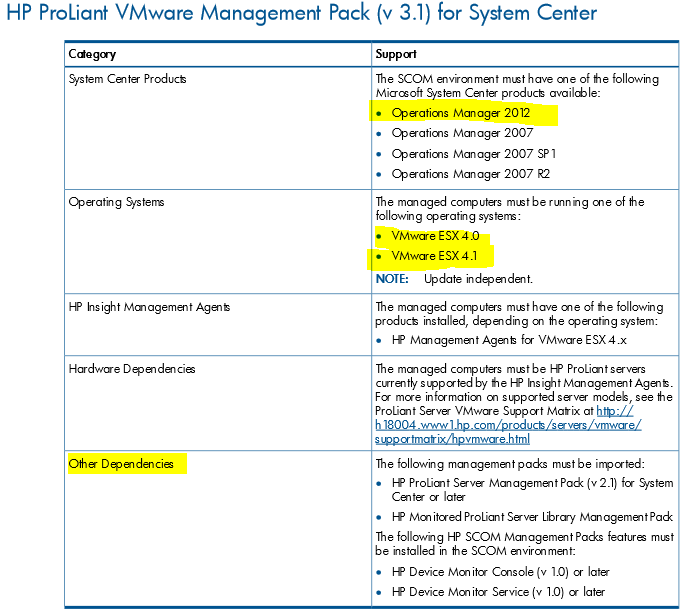 Can somebody tell me, where i can Download the HP DMC and the HP VMWare Management Pack? I tried to find it, but with no sucess. Thank you! I am so dumb! I also find it out that the SCOM Management Packs and the HP DMC are inside this ISO File. Is there a good Documentation what needs to be configured on PreG8 Systems to get it in the DMC? I am stucking on the community string for my G7 Systems but i have also VEEAM running. But i am interesting to get it running. Check the table on the post there are links to the documentation. Well if there is no management pack available, you could snd SNMP traps to SCOM and in SCOM build a trap rule with the correspondig OID. Well, if you don’t have an agent installed and no management pack you could try to discover your device using SNMP discovery wizard and the build an SNMP rule / monitor to monitor your hardware components. The problem is, that the out-of-band management using the HP ProLiant Agentless management pack is only supported by HP ProLiant DL 380 G8 and later. To be more precise, G8 Servers have on their ILO a built in SNMP which you are abe to connect using the HP Device Management Console (DMC). This provides an Interface for the Agentless MP. G7 Server do not have this ILO / SNMP capability. Hi Stefan, I am new to SCOM and need to monitor Gen8 Servers. How do I import the HP Management pack (eg HewlettPackard.ProLiant.Monitored.Agentless.mp) in SCOM. Please check this site from HP http://h17007.www1.hp.com/us/en/enterprise/servers/solutions/info-library/index.aspx#.VBqnMHlxlYd where you will find all the guides and Manuals. Need your assistance on Hardware monitoring. We are trying to monitor the HP Proliant hardware for G8 Machines. Added EFG machine name on DMC Console. Servers are not discovered in SCOM Console, Could you please assist me do I am missing any steps? Could you please let me know what details do we need to given in ADD ONBOARD ADMINISTRATOR. Confused at the Credentials part. User name and password. shall we give user name and password of the SCOM RMS Machine or any other credentials. Please help me and looking forward for your reply. The servers are not discovered yet after the installation of HP Hardware Mp. Could some one help me on my above post, Please let me know did I miss any thing. I was able to follow this article and it was of ultimate help in determining what I needed. We have DL360 Gen8 servers running VMware ESXi 5.1. DMC and HP agentless are working fine through iLO. DL380 G7 and earlier are also working fine with HP insight agent+SCOM agent and im getting all on SCOM2012. But in DMC action area there is an option “add Linux or Vmware ESX server. Can you help me how to configure VMware esxi 5.1 running on HP G8 hardware and add in side DMC console.